In partnership with Ultra Motor, Hertz launches London's first electric bike rental scheme available from our Marble Arch branch. 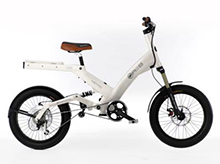 From the 15th April 2011 you will be able to hire an electric bike for an hour, a morning or a few days. Supporting the Mayor of London's pledge to make London the electric vehicle capital of Europe, our range of electric bikes for hire takes the lead in revolutionising travel in and around the city. These electric two wheelers give you the choice to pedal or cruise under power, through its high-power on demand acceleration setting. It is the best way to see London without working up a sweat and contributes to saving the environment. With every electric bike you rent you will receive full training, a lock, optional helmet and a copy of the AA Leisure Guide to London with suggested bike rides around the City. So whether you fancy a bespoke tour of London, or just don't fancy getting around by public transport hire one of our revolutionary electric bikes, click here to book.